These three bright nebulae are often featured in telescopic tours of the constellation Sagittarius and the crowded starfields of the central Milky Way. In fact, 18th century cosmic tourist Charles Messier cataloged two of them; M8, the large nebula left of center, and colorful M20 on the right. Known for its bright ring system and many moons, gas giant Saturn looks strange and unfamiliar in this false-color view from the Cassini spacecraft. In fact, in this Visual and Infrared Mapping Spectrometer (VIMS) mosaic the famous rings are almost invisible, seen edge-on cutting across picture center. What's that dark spot on planet Earth? It's the shadow of the Moon. 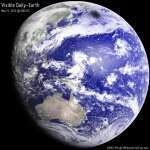 The above image of Earth was taken last week by MTSAT during an annular eclipse of the Sun. The dark spot appears quite unusual as clouds are white and the oceans are blue in this color corrected image. Who guards the north? Judging from the above photograph, possibly giant trees covered in snow and ice. The picture was taken last winter in Finnish Lapland where weather can include sub-freezing temperatures and driving snow. Surreal landscapes sometimes result, where common trees become cloaked in white and so appear, to some, as watchful aliens. Can you spot the planet? The diminutive disk of Mercury, the solar system's innermost planet, spent about five hours crossing in front of the enormous solar disk in 2003, as viewed from the general vicinity of planet Earth. This sharp cosmic portrait features NGC 891. The spiral galaxy spans about 100 thousand light-years and is seen almost exactly edge-on from our perspective. In fact, about 30 million light-years distant in the constellation Andromeda, NGC 891 looks a lot like our Milky Way. Cosmic dust clouds dim the light of background stars. But they also reflect the light of stars nearby. Since bright stars tend to radiate strongly in the blue portion of the visible spectrum, and the interstellar dust scatters blue light more strongly than red, the dusty reflection nebulae tend to be blue. How much of Jupiter's moon Europa is made of water? A lot, actually. Based on the Galileo probe data acquired during its exploration of the Jovian system from 1995 to 2003, Europa posses a deep, global ocean of liquid water beneath a layer of surface ice. It was a typical Texas sunset except that most of the Sun was missing. The location of the missing piece of the Sun was not a mystery -- it was behind the Moon. Sunday night's partial eclipse of the Sun by the Moon turned into one of the best photographed astronomical events in history.